Dylan, now 14 years old, was diagnosed last year in June with Medulloblastoma, an aggressive malignant brain tumour. After undergoing high risk brain surgery, 6 weeks of daily radiation, 4 months of intensive chemotherapy and countless other tests, procedures and medications he is now 9 months post treatment with clear scans. Still suffering side effects from treatment, he took up the challenge to raise some much needed funds for childhood cancer research. (Better treatments are desperately needed).Dylan’s favorite subject at school this year is food technology, he has an amazing food tech teacher and the timing of the lesson is most suitable to his current schedule. 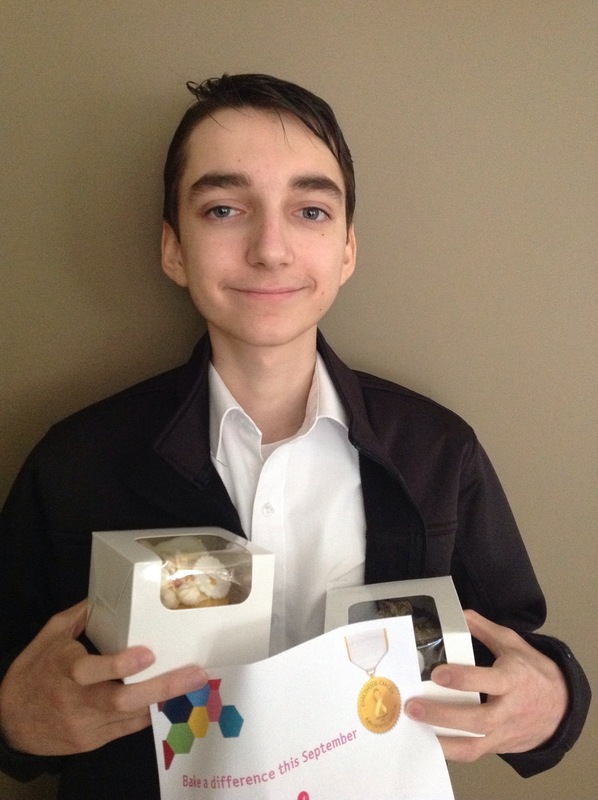 It’s rather ironic since he still has trouble with eating, but that is why he choose to do this particular fundraiser, Cupcakes 4 a Cure for The Kid’s Cancer Project. Dylan is a little shy so wasn’t keen on selling cupcakes, so we thought that by getting others to sponsor a cupcake or two, for a staff member in the oncology department of Royal Children’s Hospital would be a wonderful way to raise funds for research as well as show gratitude to those working in this very challenging area. We set a realistic target of $250, that would of been 50 cupcakes to bake and decorate, quite manageable, and the date was set for Dylan’s follow up oncology appointment, 30 October 2017. Well we were overwhelmed with the kindness of others and raised well over the target, we spent the weekend baking, decorating, labeling, just under 100 cupcakes. The week before we had prepared the labels, we included the name of the sponsor and a brief description about them, for example, best ever food tech teacher, oncology parent of Ivy, amazing distance Ed teacher, thoughtful friend etc. we also prepared fondant toppers for the cupcakes which said thank you and had a little gold heart, gold being the colour of childhood cancer. We made a variety of different things to decorate the cupcakes, including chocolate waves, almond brittle, chocolate brownies, mini meringues, white chocolate almond bites. Our flavors included, chocolate, vanilla and caramel mud cake and chocolate and vanilla sponge cake. 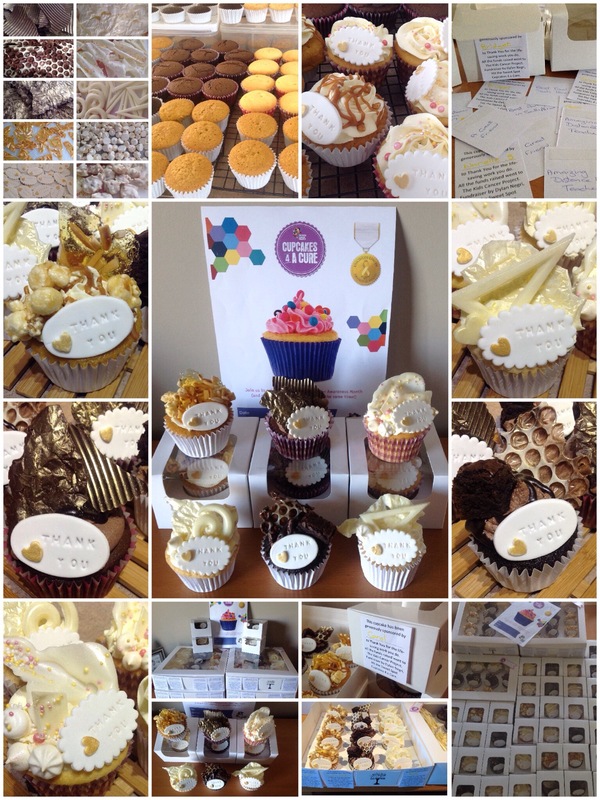 These cupcakes were the Gold collection, Sweet sugary goodness, made with love, topped high with sweetness and sprinkled in gold they symbolized the great value that goes into caring for children with cancer. We delivered these cupcakes to a few different locations in the hospital. The oncology ward, day oncology and the oncology offices all on the second floor. We took some to the MRI department on the lower ground floor, and some to emergency. We also took some to pathology because we know how much blood they take every day for oncology patients, and there was a special cupcake for the dietician and the hospital teacher too. We are very grateful to the beautiful, kind people who supported us with this fundraiser, fellow oncology parents, teachers, friends, family, to the hospital staff who are so dedicated in this challenging area, also to the researchers who work hard to find treatments that Heal and do no harm. Thank you to The Kids Cancer Project for your dedication in raising much needed awareness and funds for childhood cancer. $480 raised and 96 cupcakes later …… We did it. Sweet sugary goodness from Dylan. Posted on November 1, 2017 November 1, 2017 by blackbirdbymichellePosted in Childhood Cancer Awareness, lifeTagged Awareness, bethechange, Cancer, childhoodcancer, children, childrenshospital, cupcakes, fundraising, giving, inspiration, life, stories.